Learn quilting techniques with this first class in our beginner's quilting series. You will learn how to quickly and accurately use a rotary cutter, piece strips together with a quarter inch seam, square up blocks, and add borders to your quilt top. At the end of class you will have a completed quilt top. Join us for a 2-day event to experience all the fun and creativity possible on a serger! All levels welcome. You will create 2 projects (a garment bag and make-up bag) and will learn a ton of serging techniques and tips along the way. Sergers provided if needed! Join us for 2 full days of hands-on embroidery fun with an expert in the industry. 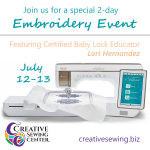 Experience so many creative possibilities and learn how to take your embroidery skills to the next level. Save the date - more details coming soon! Learn the art of free motion quilting on your own machine! Feathers, fillers, and more - plus tons of fun! All day class (10-4) with lunch included. Kimberbell 2-day Machine Embroidery Event: "Sewin' with my Gnomies"
Come create exclusive sewing and garden-themed projects! All levels welcome, your event kit and lunch is included, and we even provide a machine for you if you need one. Our Kimberbell events are always one big party you do NOT want to miss! When does each class take place? Click on each class title to see what days and times it will be offered. Many classes offer online registration. (This excludes our Kimberbell Exclusives Club and Machine Owner Classes - register via phone or in person). You can call us at 630-208-6789 to register for any class. Payment is required at the time you sign up for the class. We are able to accept credit card payments for online registrations and over the phone (Visa, Mastercard, Discover, American Express). Cash or checks are also accepted in store. Click on each class title to see what equipment and materials are needed for your class. If you do not see a supply list or you have questions, please contact creativesewingcenter@gmail.com.